How perfect are these Berries 'N Cream Cakes for 4th of July brunch?! They are sooo easy too! Just layer on whipped cream and fresh red raspberries and strawberries with some blueberries to create a fun and festive red, white and blue breakfast in no time. 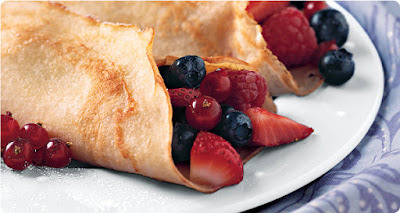 Even create a patriotic pancake bar to entertain guests, so they can stack their own! 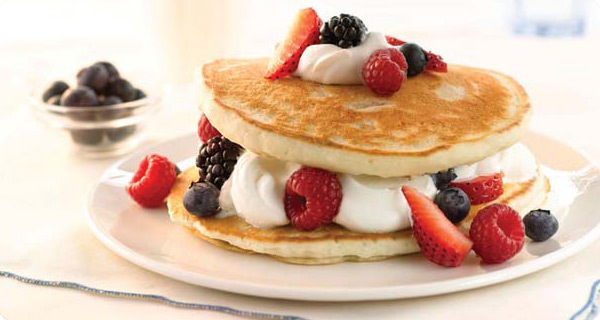 To make these patriotic dish, just prepare Krusteaz Buttermilk Pancake Mix as directed. Let cool before layering. Start with 1 pancake for the bottom layer. Add whipped cream and your favorite fruit or berries on top. Top with an additional pancake and crown of berries ‘n cream. Serve and enjoy! Want more red white and blue?! Disclosure: As a brand ambassador, this post was sponsored by Krusteaz. All opinions are my own.